The new Spider-Man video game came out for PlayStation 4 last week, and I was eager to spend a chunk of my weekend playing it. 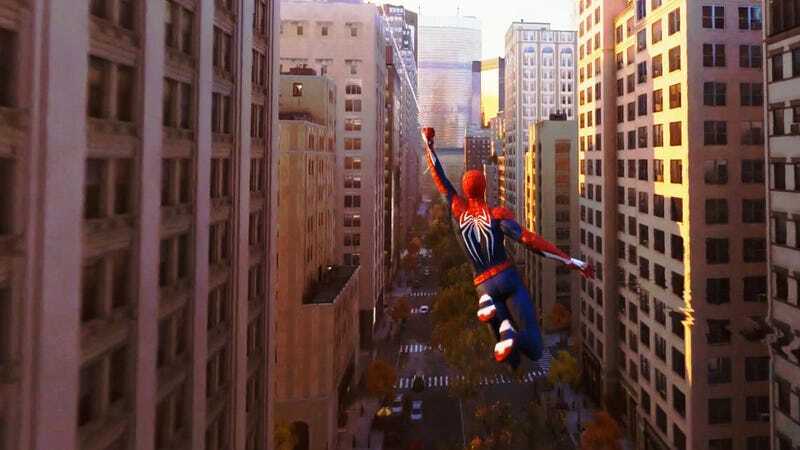 Some things I immensely enjoyed during my few hours of play time: web swinging, jumping off buildings, web swinging, whispering “whoa, that looks just like the real Empire State Building,” and web swinging. One thing I definitely did not enjoy is how the game turns Spider-Man into a friggin’ cop! Granted, I am only a few hours into the game, but so far the primary objective boils down to Help The Cops. Not just any cops, either, but the NYPD specifically, because the game takes place in a true-to-life rendering of New York City. It’s dumb to expect video games to be responsible reflections of real life, but it is also impossible, for me at least, to not feel some ickiness about the game forcing me into cahoots with even a fictionalized version of the NYPD, an organization that routinely oppresses some of the most vulnerable residents of the city I live in. I’m not grasping for as many straws as it may appear. Spider-Man doesn’t just help the cops by catching armed robbers and putting deranged super villains in jail, he helps them maintain a high-tech, citywide surveillance network. One of the ongoing missions in the game is to have Spider-Man repair NYPD operated (and Oscorp-constructed) surveillance towers that stand atop various buildings throughout the city. When these towers are repaired they allow the NYPD to monitor all citizens within a certain radius of the tower, and for Spider-Man to get real-time updates on happenings within the city via an uplink with the towers. This is a game mechanic that will be familiar to anyone who has played an open-world RPG in the last decade. What the towers functionally do is reveal areas of the game map to players so that they can find additional missions and collectibles. But it isn’t strictly a game mechanic, it’s also a narrative choice, and one that comes with some pretty obvious real-life parallels. The NYPD buying cutting edge equipment and software from a shady tech company owned by a billionaire with, uh, maniacal tendencies so that it can monitor and collect data on citizens is a dystopian yet sensible video game plot point. It’s also literally something that happened in the real New York City. Spider-Man deserves better than to be allied with such forces. A big part of the character’s appeal is that he is just as much under the thumb of the city as the people he tries to help. He’s from a shattered family, he works multiple jobs, he can’t pay his bills, he’s stressed out all the time. He’s not a hero who swoops down from on high in order to save the commoners from themselves, he is a commoner. Therein rests everything that is inspiring about the character; he’s just a guy who wants to make life better for the people who are dealing with the same struggles he is.